The gallery’s competition for January 2017 was the 7th Annual “CityScapes” Art Competition. 2D and 3D artists (including photography) from around the world, were called upon to make online submissions for possible inclusion in to the Gallery’s February 2017 online group art exhibition. The art competition and the submission process for the artists began in December 2016 and concluded on January 27, 2017. The gallery received 447 entries from 19 different countries from around the world, including Australia, Bulgaria, Canada, China, Costa Rica, Croatia, Czech Republic, France, Germany, Hong Kong, India, Italy, Japan, Netherlands, New Zealand, Russia, Spain, Turkey and the United Kingdom. In addition, the gallery received entries from 28 different states. All winning entries will now be featured on the Light Space & Time website for the month of February 2017. Thereafter, the artworks and links to the artist’s websites will remain online in the Light Space & Time Archives. Overall Winning Artists Category – The overall winning artist’s category consists of the 10 Best Entries received from the Painting & Other and Photography & Digital media categories. 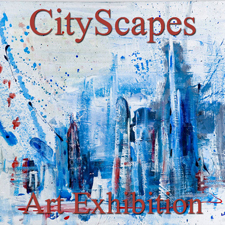 Please go to the results of the CityScapes Art Exhibition “Overall Winning Artists” Category here.